Recruiting | If you want life to change, YOU have to change! I have five kids. The youngest is in the 7th grade, one is in the 10th grade and three are in college. While they are all old enough to read for themselves now, there was a time where they loved to be read to. One of the books that most kids love to look thru are among the famous “Where’s Waldo?” collection. Each page has a collection of characters painted into a scene. Waldo creator Martin Handford assures us that Waldo can be found on each page. You just have to be persistent in your search. 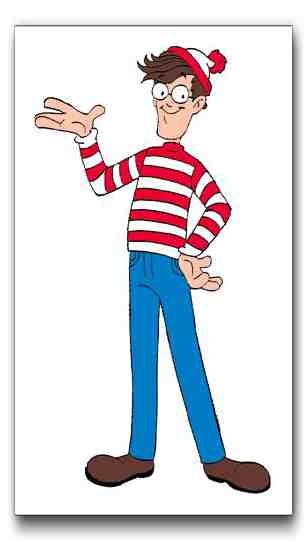 I was thinking about this concept the other day, and I began to realize that ACN is a lot like the Waldo concept. When we launch a new rep and ask them to put together their list of a hundred contacts, there are Team Coordinators and RVPs (Waldos) on every page. We just have to be persistent in our search. The next time you go thru a bookstore, take a minute to flip thru a Waldo book. You’ll see that on the first few pages, Waldo may be relatively easy to find. As you advance thru the book however, Waldo becomes increasingly more difficult to find. He’s there alright. You just have to be persistent and thorough. Anaheim is tomorrow. Off to pick up my name badge in a minute. One of the maxims of network marketing recruiting is that you “can’t prejudge” when you’re making your list or deciding who to talk to. Over the years, I’ve developed the ability to blend in with a variety of social circles. I’m just as comfortable with “the beautiful people” as I am with “pocket protector wearing, card carrying ‘geeks’.” I fit in with the OC nouveau riche, church-goers from South Central L.A, middle-class suburbanites and self-proclaimed “trailer park” trash (their term, not mine). Kirk would be the first to say that he would qualify as a member of that group called “the friendless.” Kirk and I used to work together as trainers for a previous company. Kirk is incredibly adept technically. Kirk could stand to read the book “How to Win Friends and Influence People.” Needless to say, “people skills” are not his strong suit. I called Kirk a few days ago and asked if we could get together because I wanted to “bend his ear” on a new project that I am working on, with an old boss of his (who happens to be in my downline). He called me this morning and said that he would have time today at noon to get together. After catching up for a few minutes, I let Kirk watch the ACN Opportunity video and then showed him how the videophone worked by calling his old boss. I then proceeded to walk him thru the 1-10 sheet. By the time we got to Box 3, he chuckled when I talked about how we each have “relationships” with people that companies like AT&T, Verizon and DirecTV would LOVE to have. “Maybe SOME people” Kirk offered in a self-depreciating manner. Kirk does have a bit of a “bull in a china shop” personality. He just rubs (most) people the wrong way. He’s not a jerk. He’s just could stand to refine his “people skills.” He’s very focused and analytical. He’s not the kind of guy that you look at and think “wow this guy is the next ACN SVP!” But we can’t prejudge. Kirk then proceeded to tell me that he had been in PrimeAmerica and had only sold one policy in two years. He went on to tell me how he’s not cut out for MLM. I then stopped the presentation and just started “talking” with him. Not AT him, but WITH him. I realized that whether or not he joined us in ACN? I was now presented with an opportunity to treat Kirk with compassion and understanding. As I stopped talking about ACN and started just talking WITH Kirk? An amazing thing happened. KIRK THEN started asking me about ACN and asked me to explain the comp plan to him. Before I knew it, our time was over (it was Kirk’s lunch hour). Kirk asked if he could take the 1-10 sheet with him and if I had anything else that he could take with him. I gave him a “Success from Home” magazine and thanked him for coming. I also asked him to refrain from talking to people at his work about ACN. He laughed and said, “don’t worry, I wouldn’t do that to your business. If I said anything? That would ruin it for sure!” I wanted to just hug the little guy. I guess I’ve been given a gift. I can not only BE a “friend of the friendless,” I kinda enjoy it. As I reflect on my previous group (back in the 90s), I had recruited a “Kirk” back then too. Curiously? His name was Kirk too (must be something about the name). Yet another person who was deficient in the “People skills” area. That Kirk (and his wife) worked hard to build their business. They led me to numerous people, but his persona just seemed to “get in the way” time and time again. If I had been in Phase I back then, I could have helped support their efforts by personally recruiting and placing reps in their group. I also could have taken more of an interest in the people that they led me to. But I was lazy back then. I could have been more of a “friend” to the friendless. The whole thing made me realize what I would have to do to help “this” Kirk (should he decide to come on board at some point). Some will, some won’t, so what? Not all brown apples are bad apples. Ya just gotta get out there and keep talking to people. If there is one thing that I have learned in all my years of network marketing experience, it’s that you can plan and plan all you want, but you still ultimately have to “go with the flow.” This journey to Regional Vice President is much like going white water rafting. You know where you are ultimately destined to end up. And you know the general path that you are going to take to get there. 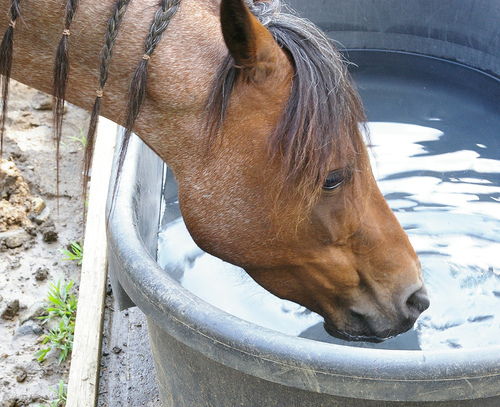 But the ebb and flow of the river make for an interesting and exciting ride. 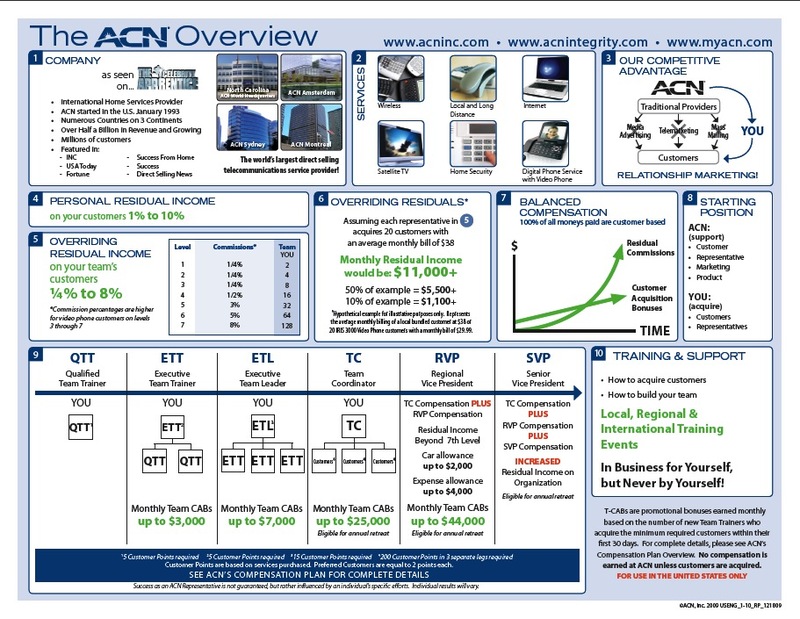 The ACN Videophone truly is the greatest tool for piquing interest that network marketing has ever known. Before too long, I was exchanging information with Jessica and we set up a time to meet at Starbucks the next morning so I could explain all about the video phone and how we make money. I ended up meeting with Jessica yesterday at 9:30 a.m. She seemed to catch the vision and said that she will be at training tomorrow in Glendora. I then drove to Woodland Hills to have lunch with a friend of mine who I hadn’t seen in two and a half years. One of the lessons that I have learned in my MLM career is to treat people with respect and dignity. We should never look at our friends as if they have dollar signs on their foreheads. Because it had been so long since I had seen this friend, I felt it appropriate to spend the majority of lunch “catching up.” This year has been a particularly trying year for my friend and I genuinely cared about the trials that she has had to face. As I drove her back to her office, I asked her how the company she works for had been holding up in this recession. She shared that they had gone thru a round of RIFs (corporate-speak for layoffs, stands for “Reduction in Force”), but that so far she has been safe. I followed that up by asking if either she or her boyfriend kept their options open in terms of making money outside of what they are currently doing. She kinda looked at me surprised and said “well I guess so. More money’s never a bad thing.” So I gave her the ACN Opportunity DVD as we parted and told her I would follow up. She promised that she would watch it. I then had a few hours to kill until my next scheduled appointment. I was 60 miles from home, so that wasn’t an option. I made a few phone calls, returned some text messages and emails and then went to a movie. It was a hot day in the Valley and the air conditioned AMC Promenade 16 theatres provided a nice refuge from the sun. After the movie ended, I proceeded to the Starbucks in Porter Ranch to meet my next appointment. At the last minute, i got a call that they needed to reschedule. I was already set up for my presentation inside the Starbucks. I had two options. I could be pissed off about it and storm off to my car. But that would only mean that I would have to sit in rush hour traffic FOR SIXTY MILES!!! I decided to “go with the flow” and just hang out. There was a Business Overview Meeting at the Hilton in Woodland Hills at 7:30 pm (or so I thought, but more about that in a minute). I could just hang around and check out that meeting. A few minutes later, a craving for a “Tall Iced Skinny Vanilla Latte” would bring a Senior from Cal State Northridge thru the door. While waiting for the “barista” to dispense her drink, the ACN videophone did its magic yet again. “What’s that?” I was asked for the second day in a row. I just laughed on the inside, smiled on the outside and answered “It’s the future…you wanna see it?” Cheri grabbed her “Tall Iced Skinny Vanilla Latte” from the counter and sat down. One of the things that co-Founder Tony Cupisz has impressed upon me is that you should never “pique” and “present” at the same time. 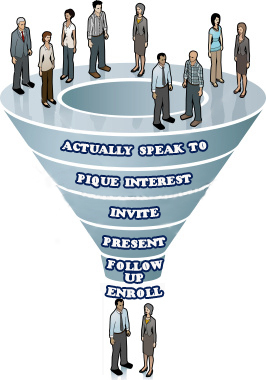 Always set a separate appointment for the presentation. A similar principle in fishing is that you want the fish to see the lure, but then you want to “take it away” a little bit. I showed my new friend Cheri the phone, but didn’t go into a full blown presentation. I’m NOT a salesman. Network marketing is about relationships. For the next two hours, Cheri and I shared stories and laughed. I had time to kill and she had nowhere in particular that she had to be. We became friends. We each drove to the Hilton in Woodland Hills and walked in where the meeting rooms are. Curiously, they were empty. We walked to the lobby (neither of us had ever been in this hotel) looking for signs of the weekly ACN meeting. Nothing. I then sheepishly walked up to the front desk and asked where the meeting was. The woman replied that ACN met at that hotel on Tuesdays nights and Saturdays. I was soooooo embarrassed. How could I have gotten that wrong? All I could think was that this 23 year old college student must have been thinking “oh so this old man lured me to this hotel for WHAT exactly?” Fortunately, Cheri didn’t respond that way. “Don’t worry about it. It happens.” HUH? WHAT? Had the Candid Cameras followed us to the Hilton? Was Borat lurking around the corner? A little while later, I had walked her thru the “1-10 sheet”, had shown her the DVD and had answered her questions. She had one final question. “Do YOU ever present at these meetings?” I told her that I would be doing the training in Glendora (about 45 miles away from her) on Saturday morning at 9:30. She then said that she would like to see me present and train and so she made plans to come tomorrow morning. Man plans and God laughs indeed. 62 more days until Anaheim.